Alaskan Rose is the star of our weekend team and we are looking forward to seeing how she measures up as she races for the first time at stakes level in the Gr.2 1000 Guineas Prelude at Caulfield. "We could not be happier with her," Michael Moroney enthused, adding that "her work this week has been the best it has ever been - she is very well." "She is of course rising in class but this looks like it will be a similar field to the 1000 Guineas so it will be interesting to see where she is at." Drawn nicely in barrier six, the unbeaten Alaskan Rose will again be partnered by Steven Arnold. The Group One Sir Rupert Clarke Stakes is Saturday's feature event and we just need a bit of luck with Yesterday's Songs who is third emergency for the $400,000 1400m contest. "He wanted to hang in all the way last time," Moroney said of the five-year-old who was in the market when unplaced in Listed company at Flemington a couple of weeks ago. "But we could not find a reason for it and he has trained on well. On his best form he would be right in this." Yesterday's Song has drawn well in barrier four for Daniel Moor. The Gr.3 Caulfield Guineas Prelude is another strong race on an exciting programme and we have two very nice three-year-olds taking their place - Strike Force and Tulsa. "It would not surprise to see either of the two in the winner's circle," Moroney said, although wary that both have drawn tricky outside gates. 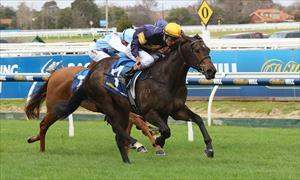 "Strike Force comes off a very strong maiden victory and we have always thought highly of him. He just needs a bit of luck from the gate but we think he is right up to this class." "Tulsa has drawn another terrible gate but his last run was terrific." Catching the eye with a close-up sixth after finding plenty of trouble in running in the Listed Exford Plate, Tulsa was many a tipster's blackbooker for the day! Earlier in the day we have Black Tomahawk contesting the Harry White Classic, a Listed event over 2400m. "He is right up in class in what looks to be a pretty strong race but he is fit and well and he comes into the race hard fit." A consistent galloper who has not missed a placing in his last five starts, Black Tomahawk will jump from barrier four for Glen Boss. And in the final event, the Cup Club Handicap, we have import Extra Noble coming out of barrier nine for Jake Bayliss. "This is another strong race and he too is up in class but he is going well and just needs a bit of luck in running to feature." And going back to Friday night, we have two runners at Moonee Valley - Lord Barrington and Serenade. Tackling the fourth event, the 1Print Handicap, Lord Barrington is up in weight but "has been racing in consistent form." "He doesn't know how to run a bad race and Jake Bayliss should give him a good run from barrier six." Classy filly Serenade is second up in the Gr.3 Champagne Stakes having resumed with a solid fifth in Listed company at Flemington a couple of weeks ago. "She again takes on some smart fillies but she was good first up and she seems to have trained on well," Moroney said.